How magnificent is this? The necklace is so grand in scale that it dwarfed all of our torso type jewelry models!! When worn the crystals overlap one another from back to front and the necklace drapes in a "U" curve. The glass is faceted and the colors are a range of blues and crystal clear. 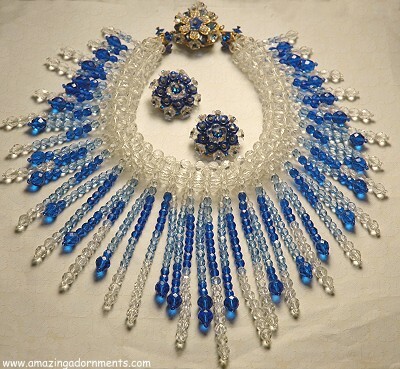 The dangles or fringe are in different sizes arranged around and wired to a collar of clear tightly sewn crystals. The collar is two rows deep with each side holding its own set of crystal dangles. The dangles get shorter as they move towards the clasp. Notice that the last crystal of each dangle is also capped with a tiny crystal. The look is Egyptian/Cleopatra to the max! The clasp is one of those that make the eyes pop! It is a tongue in groove box type and the Haskell like treatment is outstanding. Faux pearls, rhinestone tipped glass flower cups and more. The decorative section is wired to filigree which in turn is wired to the clasp finding. Both ends of the clasp have been intricately finished and they have been attached with secure metal wire. The beaded, wired and filigree backed earrings are the clip- on type. All of the metal is the wonderful Russian gold plated that was usual for the company. The hallmark appears on one earring and on the clasp of the statement making necklace. ca. 1980s. Condition: Excellent used. Minor plating wear at the reverse of the necklace clasp noted. Otherwise, normal wear for used jewelry. Measurements: Necklace: 15" long including the clasp. The longest part of the cascade has a 5" drop from the beaded collar section. Earrings: 1 1/4" in diameter.